Sanctioned by the American College of Sports Medicine (ACSM), this handy review addresses all areas of the sports medicine subspecialty board examination—with coverage that spans the full spectrum of sports medicine, from medical to skeletal conditions related to the athlete. 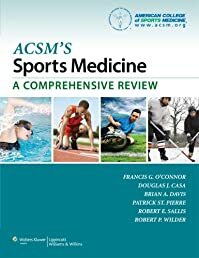 The editors and authors include orthopedic surgeons, family physicians, pediatricians, internal medicine specialists, physiatrists, certified athletic trainers, physical therapists, psychologists, nutritionists, exercise physiologists and more, ensuring that you’ll benefit from the broad spectrum of expertise embraced by the specialty. • An online companion resource includes nearly 1,000 board-style practice questions with rationale for correct and incorrect responses—a great way to test your knowledge and improve your exam performance! Pocket Medicine: The Massachusetts General Hospital Handbook of Internal Medicine (Pocket Notebook Ser..